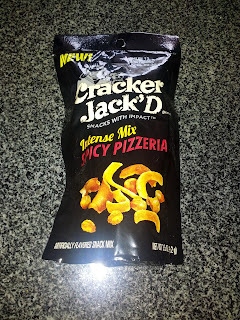 I've been pretty into snack foods lately, particularly those that I can munch on, and I do love sweet popcorns, so the new Cracker Jack'D line caught my eye. And then ... I quickly realized that it has nothing to do with popcorn whatsover. 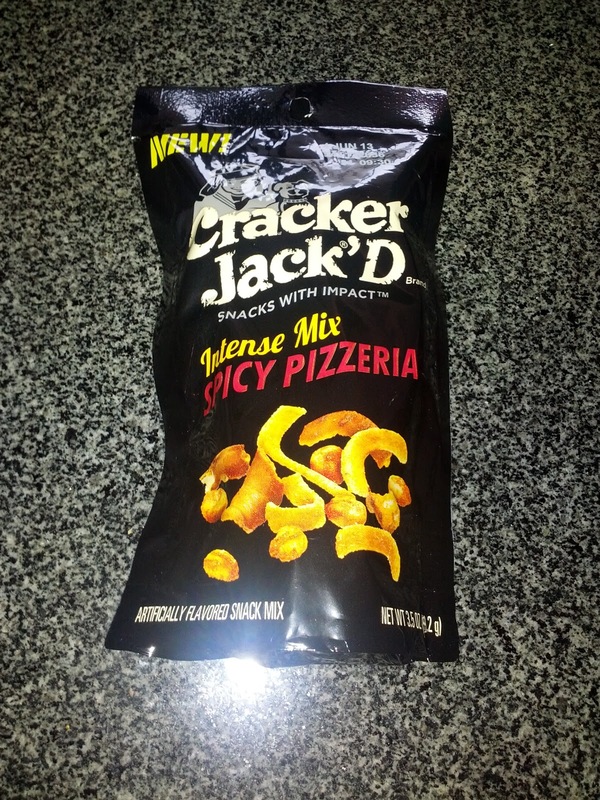 They are using the Cracker Jack name, but besides that, there is nothing else Cracker Jacky about these products. The Cracker Jack'D line features "Snacks with Impact", which appears to mean that they are either caffeinated, or supposed to help power you up. 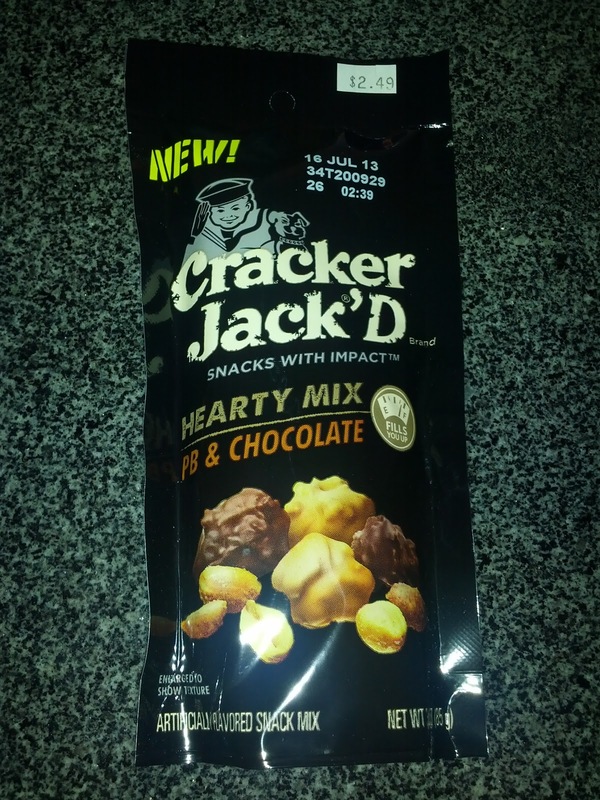 The Cracker Jack'D line is further broken down into 3 types: Hearty Mix, Intense Mix, and Sweet N Savory Clusters. There are 4 Hearty Mix products, all with flavored coated clusters and nuts, two different Intense Mix products with pretzels and corn chips, and a single Sweet N Savory Cluster, which does apparently contain popcorn. The products I had were all horrible. Do not recommend. Hearty Mix: PB & Chocolate. $2.49. I started with the most appealing one, PB & Chocolate. Always a winning combo, right? The mix is made up of chocolate covered granola clusters, peanut butter coated granola clusters, and honey roasted peanuts. I liked it. Well, at first anyway. I love peanut butter and chocolate as a combination, but that isn't usually enough to do it for me if the components aren't quality. And these were not quality components. The "chocolate" I'm sure was more corn syrup and oil than cocoa solids. The peanut butter coating I'm pretty sure didn't even contain peanuts. And the "granola clusters" were made up mostly of graham cracker crumbs. But ... it worked. It was sweet. It was salty. It tasted like peanut butter and chocolate. And it was crunchy, in numerous ways - the plain nuts or the clusters that fell apart as you bit them. But, after a few bites, it quickly tasted stale. And too sweet, particularly from the honey roasted peanuts. If I'd only had a few bites, I might have bought it again, but, after eating a full bag, even when consumed over several days, I'm done with this stuff. It is the honey roasted peanuts that ruined it, they were just too much unbalanced sweetness. Undeterred by the overpowering sweetness of the first kind of "Hearty Mix" I tried, I moved on to a savory version, the cheddar bbq. Like the PB & chocolate, it started with granola clusters, this time cheddar bbq flavored. The honey roasted peanuts were switched out for regular salted peanuts, and hickory smoked almonds were added. This almost tasted good. 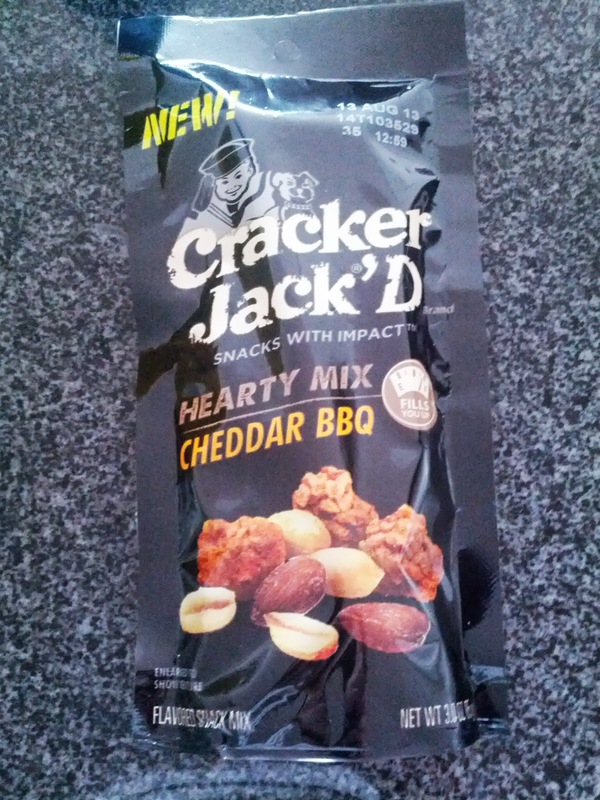 The cheddar flavor was actually good, but the bbq part was not. But ... cheddar bbq granola? Who wants that? I sure didn't. The granola bits were actually nauseating. I call them bits not clusters, as there weren't really any clusters in here. Totally all broken up. 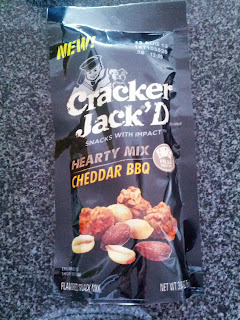 The cheddar bbq flavor was less intense on the peanuts, and they were decent. The only part of the mix I tolerated. The smoked almonds were also too strongly flavored. I like hickory smoked almonds, but not these. This was overall totally gross. I couldn't even bring myself to try more than a few bites of the granola or the almonds. Certainly wouldn't get again. I gave it to Ojan, who took one bite, and deemed it unfit for consumption. He passed it off to a co-worker, who is notorious for liking any random food we throw his way, and even he took only a single bite. It has been sitting untouched in our snack bin at work since. This was a serious fail! Intense Mix: Spicy Pizzeria. $2.49. Even after striking out with the Hearty Mix offerings, I decided to try an "Intense Mix". This was made up of pretzel pieces, crunchy corn kernels, and crisp corn sticks, all "pizza flavored". I often like this sort of snack mix, as silly as that sounds, particularly those with corn kernels and corn sticks. I even like the snack mix in the Admiral's Club! But this was not good. The flavor was just gross. A bit tomato-y, a bit zesty, but just not good at all. The pretzel pieces were assorted, abnormal chunks. They were very crisp. The corn kernels I liked for the crunch, but the flavoring ruined them. The corn sticks were unremarkable. 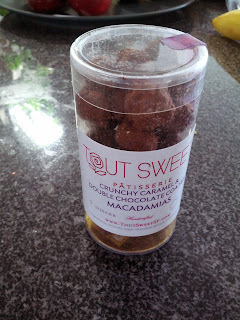 A while ago, when it first opened, I reviewed the macarons from Tout Sweet. I wasn't impressed. But I've loved the desserts that Yigit prepared at several demos I've attended, and his personality is just infectious. So when I was shopping in Macy's recently, I stopped in to grab some treats. Since I wasn't going to be eating them right away, I stuck with things I could throw in my bag and eat later. I wish I had been able to stay for some real desserts, as the display case had some insanely good looking sweets! Next time, I'll certainly go for a full dessert. Tipsy Toasted Coconut Marshmallow. $6. Root Beer Float Marshmallows. $8. 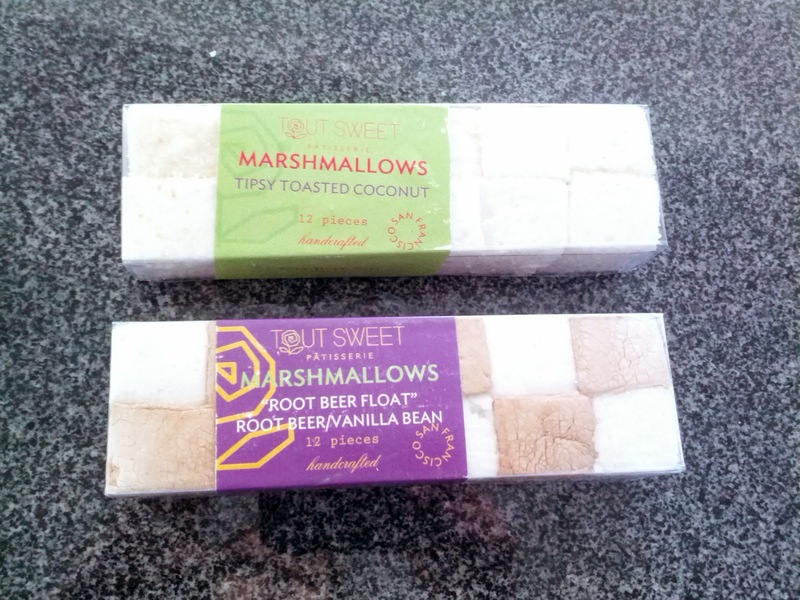 A few years ago, I claimed that marshmallows would be the new cupcakes. Soon, everywhere would have fancy marshmallows. It didn't really happen, but at least Tout Sweet delivers in this department! They had a slew of different marshmallows, available in packs of 12. I selected the two most appealing to try out. The Tipsy Toasted Coconut were described as: "Coconut marshmallow with a dash of rum rolled in toasted coconut". These were more moist than I am used to with marshmallows. I didn't actually like the toasted coconut flakes on the outside. I'm normally all about textures, so this surprised me, but the dry flakes with moist marshmallow created a strange effect. There was a slight rum taste on the finish. I really expected to love these, since who doesn't love rum and coconut, but they didn't do it for me, and I wouldn't get them again. Perhaps they would be good in an Bailey's Hot Chocolate? The Root Beef Float is a pack of two different varieties, root beer, and vanilla bean. These were both amazing. Not as moist and dense as the coconut. The root beer ones tasted insanely like root beer. I swear they were even fizzy. The vanilla bean had intense vanilla bean flavor, none of that fake crap. They were both totally delightful on their own. But combine together into a "root beer float"? Amazing. 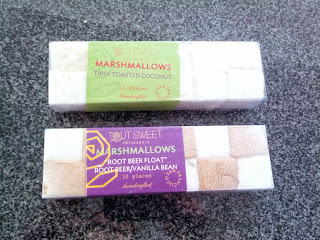 I'm going to go as far as to say that these root beer float marshmallows were the best marshmallows I have ever had. And yes, I've had a lot of fancy marshmallows, as I jump on them whenever I find them. Totally worth the $8. Crunchy Caramel and Double Chocolate Coated Macadamias. 3oz. $6.00. They also have assorted coated nuts, available in several sizes. I was thrilled to see macadamias, always one of my favorites. I did not taste the caramel at all. The double chocolate seemed to be a chocolate coating and then a cocoa powder. The cocoa powder made them more bitter than I expected, and I think that flavor would have gone better with a different type of nut. The macadamias usually have an inherent sweetness that was masked here. I did like the crunch, but I wouldn't get these again. During my recent travels, a friend gave me a voucher to use the Admiral's Club at SFO before my flight. The club opened fairly recently, in the new Terminal 2. Domestic Admiral's Clubs aren't exactly known for being lavish, or having many offerings, but they are always nicer than sitting in the main terminal. The club at SFO is fairly standard, with wifi, several seating options, bathrooms, and a bar with drinks and Amora food for purchase. Since it was new, it did have a nicer feel to it than most of the more dated Admiral's Clubs I've visited. They also have the customary meager complimentary food and drink options, although, I happened to fly right when they were in the process of upgrading the food offerings! A few days later, an announcement was made that they are "adding new selections to the snack offerings. Oranges and yogurt covered pretzels are now available all day. A mini butter croissant and a variety of mini Danishes were added to the morning options. Plus, you should start seeing an upgraded Otis Spunkmeyer chocolate chip and oatmeal raisin cookie, mixed Mediterranean olives, crudité, and assorted cheeses to pair with tomato basil crackers for an afternoon snack." While not all of these options were available when I flew, they had clearly started to roll out some of the changes in advance of the announcement. None of the food nor drink was very good, but hey, it was nice to have something to nibble on, and being in the club was far more calm and enjoyable than being in the main terminal, so I was happy enough. Cheese danish, cherry danish, snack mix, mini yogurt pretzels, cappuccino. Once I settled in, it was time to check out the food. 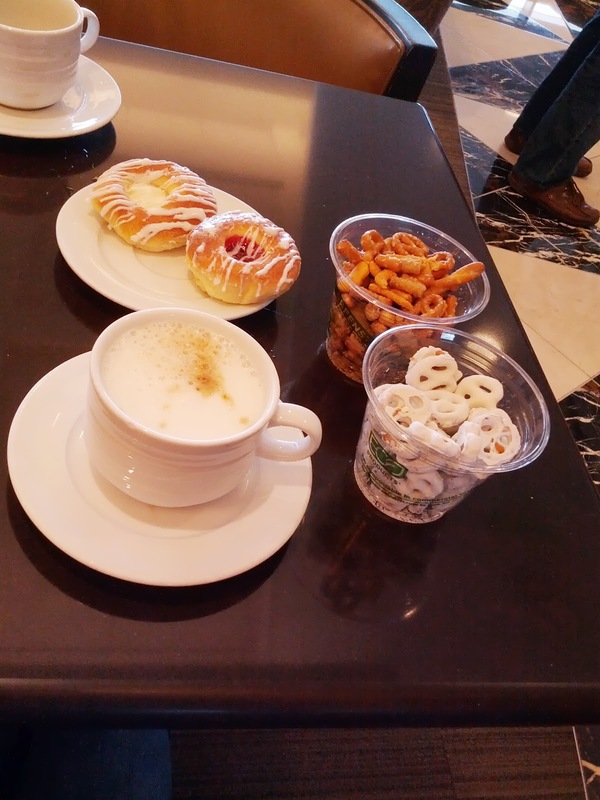 Since I was there early in the morning, the breakfast offerings were out, along with the standard snack mixes. I started with the tray of breakfast pastries, a new offering in the Admiral's Club. They had croissants and three types of danishes. I started with just two danishes, but I couldn't resist trying them all on my next round, so not all are pictured here. Croissant: Calling this a croissant is a bit generous. It was more like crescent shaped bread. It wasn't flaky, it wasn't crisp on the outside nor moist on the inside, it was all homogenous texture-wise. It certainly wasn't buttery. Serious meh. Skip this, unless you are just in the mood for kinda stale tasting bread. Cheese Danish: I went first for the cheese danish, since it had cheese, thus a tiny bit of protein, thus an ok breakfast? The pastry dough was basically the same as the croissant, dry, stale-ish, not good. The cheese filling was actually fairly tasty, with a nice cream cheese flavor. The icing was sweet, good, but kinda weepy and melty, making for sticky fingers, and a bit off putting. Cherry Danish: Next I went for the cherry danish. Again, the pastry wasn't good, the icing was melty, but the filling was sweet and enjoyable, although clearly very fake. What was good, was a scoop of the filling from the cheese danish, topped with a scoop of the cherry danish filling. It was basically cherry topped cheesecake. Totally breakfast appropriate, I swear! Apple Cinnamon Danish: And since I didn't love the other two danishes, I was feeling quite unsatisfied, and decided to try out the final one. Again, the other components were the same, but the filling was sweet, nice chunks of apple, with good cinnamon spicing. The apple cinnamon danish was certainly the winner of the pastries, but it still wasn't very good. These clearly aren't fresh. It was nice to have something carby and sweet to pair with my coffee though. Speaking of coffee, the coffee comes from a Nescafe automatic machine. There are two of them in the lounge, one is by the pastries and serves only coffee (regular or decaf), or hot water for tea (only English breakfast). There was only half and half available for adding to the coffee. The coffee was exactly what you'd expect, instant coffee. Meh. There was also water available at that station. The other Nescafe machine is fancier, and offers cappuccinos, mochas, hot chocolates. I tried out a cappuccino, but it also wasn't very good, made with milk powder, not real milk. That station had more sweeteners and milk products available, no tea. It also had a self serve soda machine, which I didn't try, and an iced tea machine. The iced tea machine turned out to be amazing. It offered a slew of different teas: unsweetened, sweetened, green, raspberry. I tried the green tea, and it was really delicious. Sweetened, but not cloying, and very refreshing. I wish they had togo cups, as I would have loved to have brought another one of these on my flight. This expanded drink station is also where the snacks lived, including their classic snack mix. This has been an Admiral's Club staple for as long as I've known. It really isn't that good, but it is somehow really addicting. I've found that it is my desire for it to be better than it actually is keeps me going. It is like 50% pretzels, although three different types: tiny standard pretzels, twisted pretzels, and little pretzel sticks. They are as generic as can be and I never like them. So I always eat far more of the mix than I want to, as I'm digging through looking for the other goodies. And there are plenty of other goodies. The spicy, slightly zesty (perhaps cheesy?) sticks are my favorites. The hearty sesame sticks have a nice texture and crunch, my second favorite. There are a few super crunchy corn kernels, although finding one of them is a true gem. And then some mediocre cheddar fish, like thin goldfish. None of the elements of the snack mix are great, yet the salt level is so high, and the desire to find a yummy bit is there, so I always keep going back for more and more. I wouldn't be shocked if this stuff contains MSG :) It also helps encourage you to drink more and more iced tea, as you start to dry out from all the salt content! Finally, I moved on to the new snack offering of mini yogurt pretzels. I have a fondness for these things in general, so I was really excited to see them. They were small, salty, but did not have much flavor. They did have the nice sweet and salty thing going on, but compared to many other yogurt pretzels I've had, they weren't remarkable. The coating seemed to be even more waxy than usual, but the tiny size made them somehow even more addicting. It was nice to see a sweet offering alongside the standard savory salty snack mix. There were also baskets of fairly sad looking fruit: apples and oranges. I didn't try any of them. Assorted cookies: chocolate chip, ginger, shortbread. Well, I had my "dessert" already with the sweet "yogurt" pretzels right? Or perhaps the crazy sugary danishes. But, at exactly 9am, the pastries were quickly cleared away, and a platter of cookies was put in their place. It was clear that 9am on the dot was when this was supposed to occur, but I was pretty surprised. There were tons of pastries left, and I'm sure others would want them at 9:30am. Who wants cookies at 9:01am instead? Sure enough, a few hours later, I was on my flight, with no food offered. I got a cup of tea, and eagerly broke out the cookies to pair with it. Unfortunately, none were good. They were all super hard and crispy. Not stale exactly, but certainly not fresh. None had any real flavor. Meh. However, just a few mere days after my flight, American announced that they are upgrading the cookies! 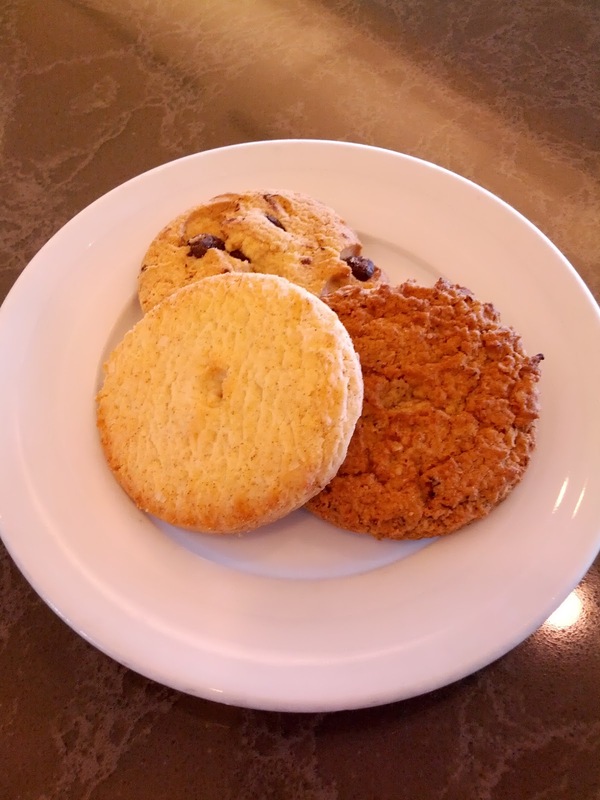 "You should start seeing an upgraded Otis Spunkmeyer chocolate chip and oatmeal raisin cookie". I'm not sure what brand these ones were, but Otis Spunkmeyer cookies have always been available for purchase inside the Admiral's Club for $2.99, although those are baked to order. I'm certain these were not the upgraded cookies, so I'm curious to see what the new ones are like. Are they warm like those served in upper class on flights? (always a highlight of my flights! The aroma of fresh baked cookies, warm, gooey, fresh cookies ... mm!) I doubt it, but hopefully they will be nicer than these. 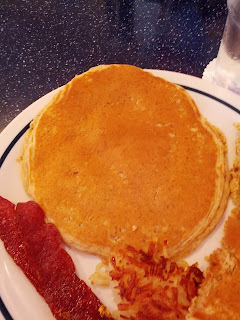 Last year, I reviewed my two visits to IHOP. Well, another year has gone by, and I went back two more times. I don't care who you are. Somewhere, deep down, you have a fondness for IHOP. I know it. We all do. Maybe it is based in nostalgia for drunken 2am outings, perhaps back in your college days. Maybe when you think about those meals now, you have absolutely no idea how you managed to ever eat a stack of pancakes, a pile of hash browns, several eggs, bacon, and perhaps a milkshake, all in one sitting. Maybe, like me, you remember the student discount nights, where as a seriously starving graduate student, you could actually go out to eat, get a full meal, and not need to starve for the next week to make up for such a splurge. Whatever your connection is to IHOP, I know you have one. Once I left graduate school, I never looked back on IHOP. I had plenty of memories there, but I could now afford a real meal, and couldn't imagine picking IHOP over one of San Francisco's amazing brunch spots. Sure, they cost 4x as much, don't take reservations, and require waiting for hours on a cold sidewalk, but come on, San Francisco brunch is a thing! Until I got sick of that ordeal, of course. A year ago, I foolishly signed up on a website that started spamming me with all sorts of birthday promotions. Most went straight to my trash. But at some point, after cursing myself several times, I embraced it. The world wanted to give me all sorts of random free stuff, just because I aged a year? Ok, fine. Bring it. One that caught my eye was IHOP. For your birthday, they give you a free meal. I had such fond memories, so I convinced Ojan to go with me (it was my birthday after all, how could he say no?). I enjoyed it far, far more than I ever expected. I was stunned that I could get a tasty brunch without waiting on a cold sidewalk for over an hour. So I went back a few weeks later with another friend. That time was less successful. So I forgot about IHOP. A year passed. And then, it was my birthday again. IHOP sent me mail proclaiming a happy birthday, and guess what, offering another free meal. It was a cold Sunday morning, typical San Francisco August. Truly miserable. And you know what? Pancakes, smothered with fake syrup, really seemed like just the thing to fix my Fog-ust blues. So I went back. It turns out, Sunday, at 11am, happens to be when everyone decides to go to IHOP. Were they all tourists? I have no idea. I couldn't believe how packed it was. The restaurant is huge, and was completely full, every table occupied. The entire inside waiting area was full. The sidewalks outside were full. What on earth? The group of 3 in front of me put down their names, and were given a 45 minute wait time. Who waits 45 minutes for IHOP? Not me. I was willing to sit at the counter, and was seated immediately. The counter was slightly less comfortable than a booth, but added a bit to the diner-esque charm. Ok, strike the word "charm", IHOP doesn't have charm, but it seemed fitting to be at a counter, ordering greasy-spoon style cuisine. It was also fascinating to sit there. From my vantage point, I could see both of the passes (IHOP has two - one serves up all of the pancakes, hashbrowns, and entree foods, the other handles all of the omelets). The pace was intense. It seemed like every other second a new plate was showing up in the window. One of a handful of servers would grab it, add scoops of butter, whipped cream, and other toppings, and whisk it away. Frantic doesn't quite explain the scene. Chaos is more like it. And not necessarily organized chaos. There were certainly plates that I saw sitting there for a long, long time, while the rest of the order for the table slowly was completed, or while it took time for a server to come fetch it. There was someone somewhere waiting on a side of wheat toast for literally 15 minutes, with the manager getting more and more upset at how it was possible that they were still waiting on the toast. The folks to my right said they waited over an hour to get their meal (they had a portion of their meal comped in the end). The manager was clearly exasperated, but kept things sorta under control, apologizing to customers, driving the staff forward. Besides the fact that it took 40 minutes for me to get a plate of pancakes, my service was good. At the counter, we didn't seem to have a dedicated server, but instead were checked in on by anyone who was wandering by. The service was very attentive, and I felt well cared for. Since I'm sure you've all been to IHOP before, and I've reviewed it in the past, I'll skip the rest of the details about a standard IHOP experience, and just focus on the meal I had. Harvest Grain 'N Nut Pancakes, Blueberry Compote, Whipped Cream. $9.69. On my two visits last year, I got the same thing both times: the Harvest Grain 'N Nut Pancake combo, featuring the pancakes, two eggs, hash browns, and bacon or sausage. Since I can get eggs cooked to order every day at work, and have never liked IHOP's breakfast meats in the first place, I was really in it only for the pancakes and hash browns. I love crispy hash browns, but I saw an order go by that were clearly soggy and underdone, so I decided to just get the pancakes. If you get just pancakes, instead of the two that come with the combo, you get a full stack of four. The pancakes are hugetastic, honestly, a single one is easily the size of 2-3 regular pancakes. So a stack of four? Ginormous pile of pancakes. My mound of pancakes barely compared with what the diners on either side of me had however. Both parties got the chicken fried steak. A huge, deep fried steak, smothered in gravy. Served with eggs, bacon, sausage, home fries, AND two pancakes. Seriously? Is this how America really eats? Sure, none of them finished it, but ZOMG. Anyway, I digress. 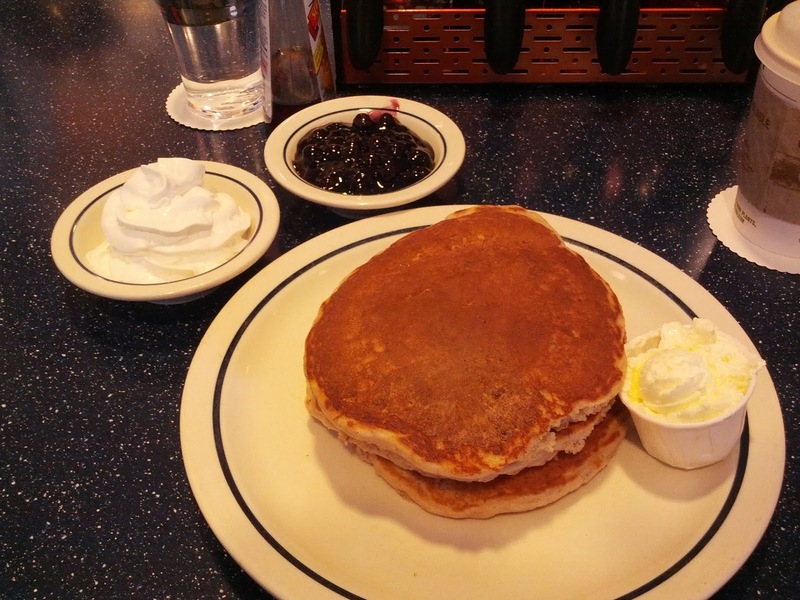 IHOP has always made pretty good pancakes, and my favorites are the Harvest Grain 'N Nut, "pancakes made with hearty grains, wholesome oats, almonds and English walnuts." So I stuck with them. This wasn't the time to venture out into unknowns! When I ordered the pancakes, my server asked if I wanted to add blueberry or apple cinnamon compote on top. I've never added such things at IHOP in my life, but her question caught me off guard. I momentarily forgot where I was. It was summer! I like blueberries! Blueberry compote sounded great. She added that it also came with whipped cream if I added the fruit. Oooh! I love whipped cream! I clearly was not thinking at all when I agreed to this. But at least I had the sense to order it on the side, in case I didn't like it, so I could add as little or much as I wanted. After my fairly long wait, with several visits from the manager assuring me my order would be right up, my stack of pancakes finally arrived. As always, I liked the texture from the nuts and oats. I love the extra heartiness and crunch from the assorted grains and nuts, yet they somehow stay moist and fluffy, and never actually feel "healthy" (which, of course, they aren't. Do NOT look at the nutrition stats!). The pancakes are normally served with a huge scoop of butter on top, which melts into the pancakes before you get a chance to extract it out and apply a more reasonable quantity. I remembered this from the last time I visited, and asked to get it on the side instead. I highly recommend this, unless a full cup of butter with your pancakes is what you are going for. Without the butter, the pancakes were a bit dry, but it was much nicer to add only as much as I wanted. The butter was really fluffy, whipped, and spread and melted in easily. I wish butter was always like this. The compote was pretty much what you can imagine. It was thick and saucy, very sweet, and clearly came out of a can. As did the whipped cream. Neither really seemed to belong with pancakes. Why would I want fake blueberry goo and whipped cream on my pancakes? I'm very glad I got it on the side, as after a few bites, it was clear I didn't want it. It wasn't that it was bad exactly, it just didn't belong. After I finished my pancakes, I did actually enjoy just eating some of the compote and whipped cream, by the spoonful, like a dessert. I noticed that the guy next to me also had the compote, and also had it on the side, but he wasn't touching his. He saw me almost guiltily eating it by the spoonful at the end, and smiled, and said, "try it warm, over ice cream. That is why I get it. I bring it home, and put it on ice cream later." Genius! I promptly stopped spooning it up, and brought it home. Later that evening, once my food coma had worn off, I heated it up, poured it over vanilla ice cream, sprinkled on some granola, added my own whipped cream, and yes, it was quite delicious. The crazy sweetness totally worked with the ice cream. Speaking of sweetness, even though I didn't eat much of the compote with my pancakes, that doesn't mean I didn't have a sweet overload. On the table at IHOP is always their set of classic pancake syrups. Not maple syrups, but pancake syrups. As in, flavored corn syrup. They are all crazy sweet. But somehow, you keep adding more. I started with the fruit flavored ones. The strawberry was very sweet, and had incredibly fake strawberry flavor. I'm not sure why I'd ever want this with my pancakes. It was my least favorite, by far. Next I tried the blueberry syrup. Also sweet (noticing a theme here? ), but it did taste like blueberries, and the thin syrup worked far better than the thick compote. After a few bites with it, I decided I did kinda like it. Sure, it was flavored corn syrup, but it was kinda good. My second favorite. Then I moved on to the ones that actually resembled "maple" syrup, at least they weren't red and blue! The butter pecan was somehow even more sweet than the others. Kinda sticky sweet. It did taste like butter, and pecan, but was just way too much on the pancakes. I could imagine it being good on ice cream. But certainly not on these pancakes. Second to least favorite. Finally, I went for the last of the syrups, the old fashioned. It was again sweet, slightly maple flavored, kinda classic fake syrup. It worked with the pancakes, particularly when slathered in butter, and was my favorite. I was kinda dying from sugar overload at this point. Between all the syrups, the compote, and the sweetened whipped cream, I thought I was going to jitter my way off my little stool. So near the end, I decided to try the sugar free syrup. I didn't expect to like it, but figured it was worth trying. Sometimes, ok often, I try things just because I know I'll be writing a post, and want to be complete. The other four syrups are IHOPs own product, in little custom dispensers. But the SF syrup was Cary's brand, in a regular squeeze bottle. It tasted like any other fake syrup to me, not noticeably SF. If you are going for the regular syrup, I don't see any reason not to pick it. The pancakes were fine, but honestly, not as good as I remembered. Same with the syrups. I remembered being addicted to them in the past, but I was pretty sick of them by the time I finished my meal this time. And, I felt awful. That horrible feeling from having eaten far too much fast food stuck with me all the rest of the day, all evening, well into the night. And the crash I experienced once the insane amount of sugar wore off was debilitating. I didn't want to move off my couch by 3pm. I can't say I am in any rush to go back to IHOP. I know from past experience that the variance in their food is high, but I wouldn't go back for this meal. My big stack of pancakes was $9.69. If I'd skipped the blueberry compote and whipped cream, they would have been $8.99. Decent enough price, although the combo seems like a better value, as it is $9.99, and although it contains only half as many pancakes, has the eggs, hash browns, and bacon/sausage. Either way, this was my free birthday meal, so it didn't matter. Last week, I went to IHOP for my annual birthday pilgrimage, to redeem my certificate for a free birthday meal. My pancakes weren't bad exactly, but they weren't great, and I left with a serious craving for more pancakes (well, not that day. That day, I left feeling ridiculously ill, and that feeling lasted literally all day, all night, and into the next day. I certainly didn't want more pancakes then). As I wrote up my review of those Harvest Grain 'N Nut pancakes that I didn't quite enjoy, I also pulled up my review from my trips a year prior. I had forgotten how inconsistent my two visits were then. Every single aspect of my two meals then, only a week part, was totally different. One time my food was served cold, everything was overcooked, and covered in oil. And the other? It was great. So, I decided to give IHOP another chance. I really wanted some good pancakes! I again sat at the counter, with full view of the breakfast side of the pass. Given how long I was about to wait for food, it turned out to be a good thing I had an entertaining seat. It took 45 minutes to get my order, and over an hour before I was actually delivered the correct meal (more on that later). Although I was there a bit earlier, it was still insanely busy. The number of guests they serve during weekend brunch is really quite impressive. And when you realize that every IHOP meal is composed of a main dish and at least 3 different sides, it really adds up. But they don't handle the rush very well. I was again absolutely shocked at how long some plates sat in the pass. I obviously don't understand the workings of their kitchen, but it seemed like the biggest problem is that they didn't even try to make different dishes for a single table come up at the same time, let alone even just the components for a single meal. The pancake/waffle/toast side seemed to be pumping things out at a lightening pace. That pass was always full. But it was full of incomplete meals, as the egg/meats/hashbrowns side wasn't running nearly as fast. I watched a single stack of pancakes sit there for ... 17 minutes. I think the average time was somewhere around 10 minutes. Honestly, I felt so sad for all of the food sitting there dying. It totally explains how on one previous visit I was served totally cold food (and on another, it was fairly hot and fresh). Consistency is not their thing! I was even more horrified when the pass literally got full, so one server started taking things out of it, onto the counter. Now they weren't even under a heat lamp. Again, this explains many things. There also seemed to be little rhyme or reason to how he'd pull down an order. I got that he's start assembling an order by pulling all the different plates down onto the counter. And then, he'd add all the garnish for a single plate - butter, fruit compotes, bowls of fruit on the side, etc, but he'd pull down a bunch more plates, add garnish to one, bring it out to table, leaving the others still all sitting there getting cold, add garnish to another, maybe two at a time, then pull down more, then walk away .... it was odd. I'm sure he had a system, but I never figured it out. Anyway, it was frantic, yes, and they surely push out a lot of meals, but it seems like they could do a much better job of timing. Most of the food actually looked good, and as I was sitting there for a full hour, I got to see pretty much the entire menu go by. Some of the waffles, with interesting toppings, in particular looked pretty good. And the food, once I got the correct order, was good. Perhaps my best visit thus far, and, as I said last year, on par with any fancy brunch establishment. I know the eggs weren't free range, and the pancakes were made from a mix, but sometimes, that just doesn't matter if it tastes good, and is well cooked. And it was. The service was pretty good, seemingly inattentive, but somehow my water glass was always refilled, and several people stopped by to apologize for my long waits. When I went last week, I saw the sides go by when I first sat down, and the hashbrowns, one of my favorite parts of an IHOP meal, all looked raw and undercooked, so I ordered my stack of pancakes only, no combo meal. But IHOP is all about the combo meal! You aren't supposed to just get a gravy smothered chicken fried steak, you are supposed to get it with 2 eggs, hashbrowns, sausage, and biscuits! Your massive omelet clearly needs to come with pancakes and bacon on the side. Duh! So this time, I went for the combo I usually get, the Pick-A-Pancake Combo: "Your choice of two same-flavored famous pancakes. Served with two eggs, hash browns and your choice of two bacon strips or two pork sausage links." I also figured if the pancakes weren't great, the sides might be, or vice versa. Hedge my bets. As much as I always love the Harvest Grain 'N Nut pancakes, I was feeling a bit disillusioned by them from my last visit. And um, I was at IHOP. It isn't like my choices for pancakes were lacking. I could go basic buttermilk ... meh, boring. Or buttermilk topped with assorted compotes (cinnamon-apple, strawberry, blueberry) ... but the blueberry compote was just sweet and not interesting last time, and I had no more hope for the others. Or basic buttermilk topped with "glazed strawberries", bananas, and whipped cream ... hmmm, more nasty fruit topping? Or I could add chocolate chips, or, switch out the base for a chocolate pancake with additional chocolate chips, and whipped cream of course ... not quite what I wanted in the morning. Speaking of not what I wanted in the morning, there were also red velvet pancakes, topped with cream cheese icing, powdered sugar, and whipped cream, or Cinn-a-Stack pancakes layered with "cinnamon roll filling", cream cheese icing, and powdered sugar. I'm sure I'd love a bite of the later ones, but an entire stack? ZOMG. So, I decided to be fairly boring, and went for the Whole Wheat Pancakes with Blueberries. I figured they were most likely to be similar to my Harvest Grain 'N Nut pancakes. So, I ordered the Pick-A-Pancake Combo, with whole wheat blueberry pancakes as my pancake selection. My server asked how I'd like my eggs cooked. I asked for over-medium. He asked if I wanted sausage or bacon, and I said turkey bacon. I also asked for the butter to be on the side, since I knew they tend to add copious mounds of butter, and he looked confused, and told me that it didn't come with butter, since it was a healthy meal, under 600 calories. He also pulled out the sugar free syrup for me. Hmm. I was a bit confused at that point, because uh, just the eggs, hashbrowns, and bacon were 600 calories! I remembered that they had another combo on the menu, the "Simple and Fit Whole Wheat Pancakes with Blueberries". But that one was a special combo, and instead of coming with eggs, hashbrowns, and choice of breakfast meat, it came with "scrambled egg substitute" and turkey bacon, no choices. Since he asked how I'd like my eggs cooked, and what kind of breakfast meat I wanted, I couldn't possibly have been ordering that one. So, imagine my surprise when my order was delivered. On one plate, as expected, was two pancakes. On the other ... some nasty looking, dried out, scrambled egg stuff and two strips of turkey bacon. The person delivering my meal was not the same who had taken my order, so I explained, "no, I ordered my eggs over medium, not scrambled". He looked surprised and said, "the egg substitute can only be scrambled, it isn't whole eggs to begin with", and set it down, and started to walk away. Then I noticed the lack of hashbrowns, which is honestly THE reason I went for the combo. So I said, "and I was supposed to have hashbrowns?" He said, "no, the Simple and Fit combo does not have hashbrowns." Sigh. It was clear what had happened. At this point my server came over, and I tried to explain this was not what I ordered. He insisted I ordered the Simple and Fit one, to which I replied, "So, why did you ask how I wanted my eggs cooked? And what breakfast meat I wanted?" My plate of sides was quickly whisked away with an apology. Whole Wheat Pancakes, Blueberry Topping on the side. With my sides taken away, I was left with just my pancakes. I didn't mind this exactly, but it would have been nice to have some variety in my meal, alternating sweet pancakes with salty hashbrowns for example. Anyway. I eagerly dug into the pancakes. The description said that they were topped with "lightly sweetened blueberries", so I assumed it was the same as the blueberry compote from my previous visit. Not that lightly sweetened even begins to describe that stuff, but I didn't think they had multiple types of blueberry topping available. So I asked for it on the side. It was way too sticky sweet last time! But this blueberry topping was entirely different. It really was just some blueberries, in a thin, lightly sweetened syrup, not a thick, insanely sweet, compote. They clearly weren't fresh berries, were fairly mushy, and were kinda flavorless and watery, but, a more healthy option, for sure. I had a few bites of my pancakes with the berries added, but didn't find it added much, and opted for syrups instead. When I bit into the first pancake, I noticed that it tasted a bit doughy. Not bad exactly, but doughy. As I took my next bite, closer to the center, I noticed that the pancake seemed like it was cream stuffed? A few more, very doughy bites later, I realized, no, they weren't cream stuffed, they were just totally raw. Again, I didn't mind exactly, it was kinda a nice taste, but clearly wasn't supposed to be like that. I hesitated a minute, looking up to see if my server was around. He wasn't. I had no problem eating doughy pancakes, and I assumed that even though they must have raw egg in them they were cooked enough to not be a health risk ... right? I hesitated one more second, but since I didn't have any of my other sides, as they were being replaced, and since I'd already waited about 45 minutes for my meal at that point and I was pretty hungry, I decided not to say anything. But ... the manager, who I was so impressed with on my past visit in how he was overseeing everything, trying to keep food flowing out of the kitchen, saw me looking up. I didn't say a word, but he swooped over, said, "those are very undercooked", and took them away promptly. He also ended up comping my meal (I'm assuming it was his doing, as I saw him do that for a number of people the previous weekend when the kitchen was screwing things up left and right). My server saw that my pancakes were gone, and looked at me bewildered. "What was wrong with your pancakes?" He glared at me. I really wasn't trying to cause problems, and like I said, I wasn't even going to say anything about them. And he is the one who messed up my original order! I said, "they were undercooked, pretty raw in the center", and he just gave me an exasperated look. Not unfriendly exactly, but he was clearly busy and flustered. 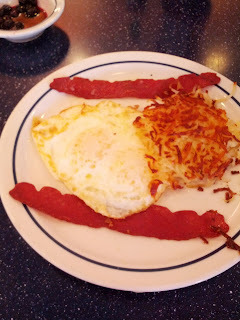 Hashbrowns, 2 eggs over medium, 2 strips turkey bacon. Another 8 minutes passed, before my correct sides appeared. They didn't come through the pass like everyone else's, but instead came directly carried out by someone from the kitchen. Once I got my news sides, I was pleasantly surprised by how good they were. As I mentioned, during my visits last year, I had completely inconsistent experiences with the sides: one time the eggs were under done, the next they were way over done, one time my food was hot, the other cold, one time the hashbrowns were seasoned, the other bland, and one time my eggs were just swimming in oil. So I had basically no expectations for my sides this time around. I figured if they were good, I'd eat them, but otherwise, the big pile of pancakes was plenty to fill me up. The eggs were hot and fresh. They weren't loaded up with oil. They were slightly less done that I would have liked for over-medium, but, not bad. The whites were a bit crispy like I like, but not rubbery. Some of the better eggs I've had. The hashbrowns were awesome. They weren't seasoned at all, but I had salt at the counter, and I wanted to load them up with syrup anyway, so I didn't mind. They were also served hot, the exterior super crispy, the inside fluffy but still fully cooked. No raw potatoes here. Classic hashbrowns, nothing mindblowing, but well executed. My only complaint is that my hashbrown portion seemed majorly downsized from my two visits last year! In fact, my sides came on a standard size round plate, rather than the platter they normally come on. The turkey bacon was ok, cripsy, salty, not too oily, pretty good. I don't love turkey bacon, but I wanted to try something new, so I went for it. Even better when slathered in syrup, the sweet and salty combo is one I always love. And finally, my new pancakes arrived, again, brought out directly by someone from the kitchen, rather than through the window. This time, my pancakes were also much larger. I'd even say double the size? I imagined that IHOP just has a standard scoop they use for the batter, but I guess not. 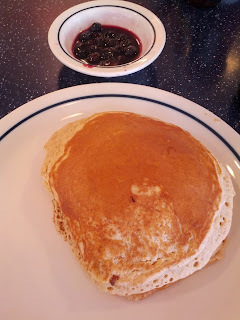 On my visits last year, I remember thinking it was odd how my pancakes were different sizes on my two visits. Maybe this is also why they can't seem to cook them consistently? The pancakes, like my sides, were piping hot. They were well cooked. Not overcooked, not undercooked. Nice and fluffy. And, I really liked the whole wheat flavor. They also had a buttermilk base, so there was a bit of tang. I liked these far more than my precious Harvest Grain 'N Nut pancakes on my last visit, although that really may have just been because my Harvest ones were a bit overcooked? Either way, these were good. I had a hard time stopping myself from eating them all (there were 2 huge pancakes, essentially 4-6 pancakes in normal size pancakes, and I'd already finished my eggs, hashbrowns, and the original half a pancake!). I did a pretty amazing number on these given how full I already was, they were that good :) And the leftovers that I took home re-toasted nicely and made for a great late night snack! I experimented with different toppings. As I mentioned, the blueberry topping wasn't much of anything, just some watery un-thawed frozen berries. I also found the blueberry syrup to be too sweet and not very flavorful, which was funny, because in all my previous visits, I liked that one the most, and remarked on how much blueberry flavor it did have. My favorite this time was the butter pecan. Again, funny, because on my last visit I hated that one and thought it was far too sweet, although on one of my previous visits I liked it. I can't imagine there is actually a difference in the syrups between visits, so it really must just be me liking different things and different times? Anyway, the butter pecan went perfectly with the whole wheat. I'd order these again in a heartbeat. I would have a moment of self-doubt of course, wondering if the Harvest Grain 'N Nut would be better, but these are certainly now in my rotation. With the butter pecan syrup, of course.